Party Bag of the week was so popular for its launch last week we can't wait to see what you all make of this weeks choice! Every week we will announce this party bag of the week and a generous discount to every order placed within that week! At £1.65 for 7 Party Bag toys and a loot bag, Fruitilicious already represents great value for money with a generous 24p saving on the RRP of party bag toys, so with a further 20% discount its great value this week. Well to start everything is supplied in a Stars loot bag that also has musical notes and a skull and cross bone design on it. Insided your party bag you also get a nice pink balloon, a fruity themed lipgloss keychain, and a 5 pce fruity stationary set, there is a notepad, pencil sharpener, eraser and two mini pencils. 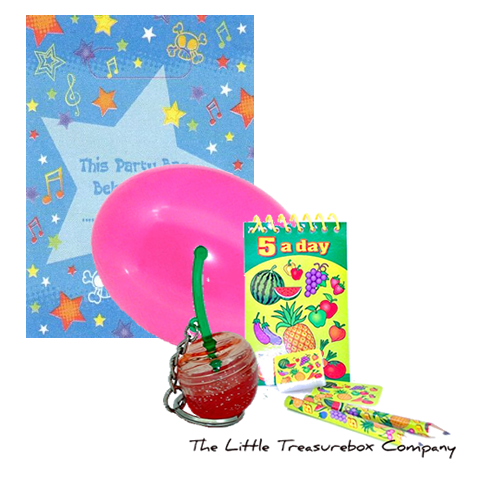 Or check out our other great girls filled party bags, boys filled party bags and other great party offers.